At Nature's Best we provide a wonderful and very extensive range of quality grooming products that will make your dog or puppy look and smell great! Whether you are looking to brighten your dog's coat or detangle their fur, Nature's Best has combs, shampoos and conditioners available to cover all of your dog's grooming needs. The PET HEAD range for dogs provides convenient solutions for those daily pet owning challenges such as muddy paws, coat shedding or rolling in unpleasant odours. With fresh and unique fragrances across the range, your pet will always look and smell great! This powerful yet gentle formula actually neutralises odours and doesn't just cover them up! Baking soda and ordenone deodorise and freshen the coat, while the vegetable protein extract and hydrolyzed soy protein helps build body and elasticity, leaving the coat looking fuller and luscious. This brightening shampoo keeps your dog's coat sparkling white. Argan Oil works to nourish and strengthen the coat as it re-hydrates. Natural citric acids, Vitamin B3 and yummy freshly-squeezed "orangelicious" smell leaves your party animal brighter, shinier and livelier than ever! This amazing formula soothes skin irritations caused by insect bites and dry skin. The oatmeal and aloe vera work together to soothe the skin and the tea tree oil helps to purify, fortify and moisturise hair follicles. The added wheat protein, vitamins and chamomile extract nourishes the skin and leaves the coat silky and conditioned. Is your dog feeling flaky? This quenching formula helps to gently moisturise and calm irritated and dry skin and restores the coat's natural luster for dog's with sensitive skin. The yucca and chamomile extracts, as well as the silk proteins, work together to soothe and nourish the skin, leaving the coat conditioned. Provide comfort for your dog! This natural shampoo is blended with oatmeal, aloe vera, and vitamins E & C, it gently moisturises to help calm your dog's sensitive and dry skin. The jojoba oil and oatmeal work together to moisturise the skin and soften your dog's coat. This deep conditioning creme rinse delivers a tangle-free, soft and silky coat for dogs with curly and long hair. The oat protein nourishes and strengthens the hair shaft, leaving the coat fuller and healthier. The calendula extract helps restore softness and vitality to the coat while soothing the skin. Power to your puppy! Our super gentle hypoallergenic tearless shampoo makes bath time fun! The shea butter and safflower oil soothe and nourish the skin, while also restoring elasticity to the coat. Leaves your pup looking "puppylicious"! Fun times guaranteed. High maintenance never looked so good. First, shampoo and rinse your dog's coat and then smooth this leave-in conditioner all over while avoiding their eye area. Blow dry and instantly make your pooch look ready to face the paparazzi and be the talk of the town. This waterless spray shampoo is a convenient and fast way to clean your dog without water. This spray on and non-rinsing shampoo cleanses the coat without water, making it perfect for trips or a quick freshen up between baths. No more terrible tangles! Simply spray on your dog's dry coat, for tangle free, smooth and shiny fur. It effectively detangles knots and tames fly-aways whilst also conditioning your dog's skin. Oatmeal Paw Butter soothes and nourishes dry, cracked paws. Combining shea butter, oatmeal, mango, vitamins E & F, jojoba, coconut oil, olive oil and aloe vera to help keep paws super smooth. Just gently massage into paws and go play! This quick and easy magical deodorising spray neutralises and eliminates any odours on contact. Simply spray this deodorising spray onto your dog in between baths or after playing in the park to keep your pooch smelling super fresh all day long. Use these orangelicious wipes to clean your pup's paws after walks, to freshen up their face and to wipe their booty. Hypoallergenic wipes keep your dog looking good and feeling great! PET HEAD's "Dirty Talk Shampoo", "Life's An Itch" and "Oatmeal Shampoo" are all available in 3.79ml sizes. The Hartz Groomer's Best Combo Brush for Dogs features two brushing actions in one for a shiny and detangled coat. The pin side detangles and removes any loose hair, while the nylon side redistributes natural oils for a more healthy, shiny looking coat. The Hartz Groomer's Best Dog Flea Comb is designed to easily remove flea eggs, fleas and any other debris from all dog coat types. The comb features extremely fine teeth for maximum efficiency. 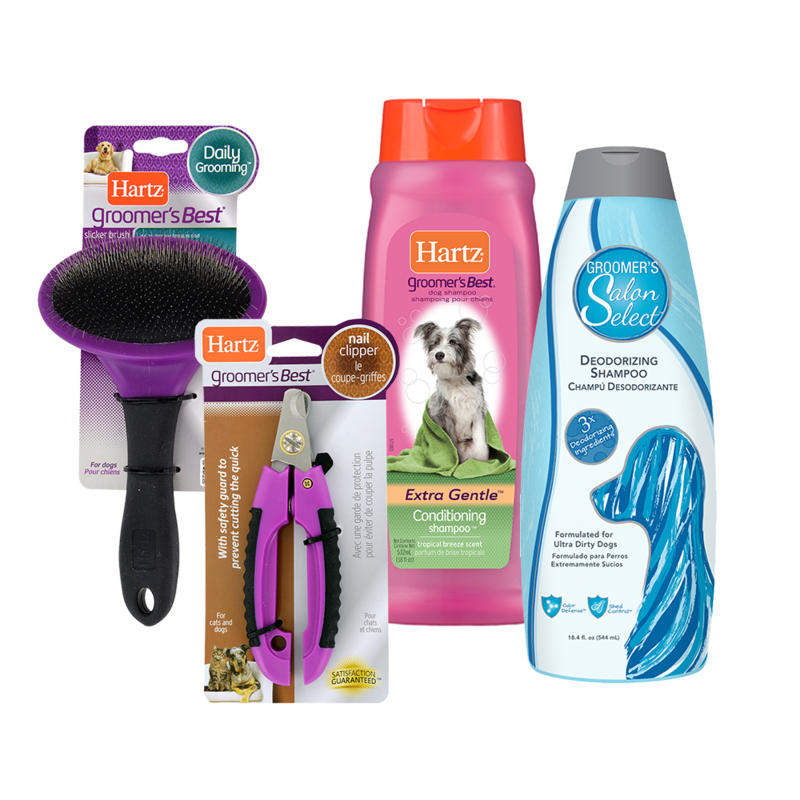 ​The Hartz Groomer's Best Dog Slicker Brush is specifically designed for curly, long and heavy coats. It is ideal for everyday maintenance and assists in the de-shedding of loose hair and removing excess undercoat. The Hartz Groomer's Best Nail Clipper is great for at-home maintenance for all breeds. The ergonomic handle and unique angle of the clipper makes it easy to keep your dog's nails trimmed to a healthy and comfortable length. Hartz Groomer's Best Shampoos are specifically formulated to meet the needs of different coat types for regular essential grooming. Designed to be gentle on your pet's skin and to improve health and shine. Keep your furry friend smelling clean and fresh with Hartz Groomer's Best 3 in 1 Conditioning Shampoo for Dogs. With a soothing tropical scent, featuring panthenol to detangle and keratin to moisturise your dog's skin and coat, this conditioning shampoo leaves your pet's coat silky and shiny. Giving your furry friend a soothing, cherry blossom scent, Hartz Groomer's Best Whitening Shampoo is a specially designed formula that brings out the natural brilliance of white, silver, and grey coats. Also reduces any discolourations, while leaving your dog's coat clean, healthy, and shiny. ​Specifically designed for sensitive dogs to help relieve their itchy and irritated skin, Hartz Groomer's Best Oatmeal Shampoo soothes your dog's skin while washing. The buttermilk scent and gentle formula features moisturisers and protein conditioners to leave your dog's coat feeling soft and silky. ​Keep your furry friend smelling fresh with the Groomer's Best Odor Control Shampoo. Designed to remove and control deep down odours. Gentle formula to refresh the dog's coat and skin with a soothing, green apple scent. Keep your little furry friends clean and smelling fresh with a specifically designed, extra gentle formula for puppies that leaves behind a soothing jasmine scent. Hartz Groomer's Best Puppy Shampoo is mild and tearless, cleaning and moisturising your puppy's coat while not irritating their skin or eyes. Keep your furry friend smelling fresh in-between baths with Groomer's Best Sprays for Dogs. The Oatmeal Spray has a soothing buttermilk scent that should be your "go-to" choice when wanting to keep your pet clean and fresh, while also relieving their itchy and irritated skin. While the Conditioning Spray has a tropical breeze scent and works to gently moisturise, condition, and detangle a dog's coat, while also improving their overall health and shine. Groomer's Salon Select Shampoos and Conditioners are gentle on your pet's skin and improves coat shine and health. ​The range covers different needs for different coats. Formulated for your dog's white coat, this shampoo assists in removing any stains or discolourations, while boosting the natural brilliance of their coat. Contains no bleach or peroxide. Formulated to soothe, calm and moisturise your dog's skin naturally, while relieving itching and speeding up the healing of any irritated or dry skin. Contains oatmeal and baking soda. Gentle and tear-less shampoo, formulated for your puppy's sensitive skin. Contains no harsh detergents or irritants. Formulated for ultra dirty dogs, this shampoo works to remove and control odours. While soothing your dog's skin, this shampoo also leaves their coat looking shiny, clean and healthy. LM Farms Freshener Spray (355ml) effectively removes dirt and oil from really dirty dogs. With a beautiful lemongrass and parsley scent, this scented spray eliminates odours and provides long-lasting freshness.